motocross girls - from real MotoX riders to model babes. A Few of the Motocross Girls around the World. At any age, dirt bike girls are special. The level of competition, guts and ambition increases each year in many of the countries across the world. They come from many countries, seeking their place in a sport that just recently understood the powerful fan base and economic effect that follows them. 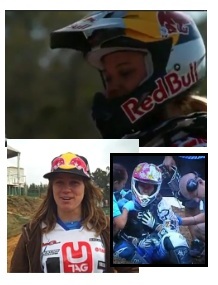 Following are just a few of the females making MX history. A great example of motocross girls, Livia Lancelot of France is the first female champion in motocross history with the victory achieved in the FIM 2008 Women’s MX World Championship. She finished third in the 2005 and 2006 FIM Women’s Motocross World Cup on a Yamaha. The following year, she joined the Kawasaki GPKR Team and rode a Kawasaki 250F to second place. Livia took her Kawasaki to first place at the 2008 Grand Prix of Bulgaria and the 2009 Grand Prix of Portugal. Livia put her incredible speed to good use at XG 2011, her first attempt at indoor racing. Riding at age four around the family garden, she stepped it up winning two titles in the 60cc class and later in the 85cc division. 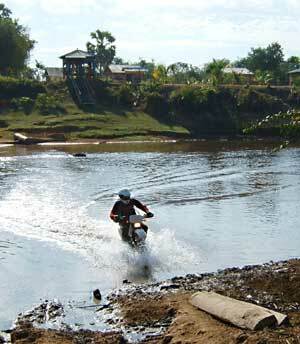 When FIM granted recognition to girls in 2005, she jumped in feet first. Part of Team Rockstar Bud Racing Kawasaki., she had a podium finish at X-games 2010 and is the 2012 winner of the second round of the Women’s World Championship French Grand Prix. Born in Parma, Italy on March 10, 1994, Chiara Fontanesi is one of the motocross girls that has taken the world by storm. She was not yet three years of age when she started riding. Working on technique and skill since then has resulted in limelight results. 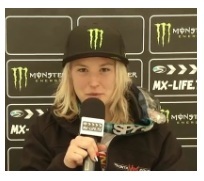 Doing Yamaha and Monster Energy proud, Chiara picked up a win in Holland for the first round in the 2012 women’s world MX championships. The second round in France produced a second place finish. Each year of competition adds to her speed and edge. Other sponsors include Spy Optic and Syneco. The Sidi Crossfire MX boots identify yet another sponsor. Say them in the same breath because these names create a lot of competition for one another. Her professional motorcycle racing contract with American Honda in 2009 (a female first for the company) brought just a bit more attention to Ashley Fiolek, another one of the exceptional motocross girls. In 2009, she spoke at the AMA International Women & Motorcycling Conference held in Colorado to explain why competition and challenge are so beneficial for females. Three Women’s championships and two X-games gold medals later, she is still an example of good sportsmanship and competitive spirit. What else is she up to? Try the introduction of the joy of the sport to hundreds of thousands of readers of Vogue Magazine with her feature in the April 2012 issue. Red Bull teammate Tarah Geiger took a third place finish in the WMX 1 championship at Pala Raceway September 2011, while Ashley, more to keep the lead for the championship than to risk everything, took second. Out in front, Jessica Patterson took and kept the lead, but Fiolek kept enough of a lead to win the overall 2011 WMX championship. Pala’s overall results were Patterson, Geiger and Fiolek, but the championship standings for these motocross girls read Fiolek, Patterson and Geiger. Dirt bike girls add a lot to the sport. Motocross girls are great to see if you're a boy or girl. We have some excellent riders who are ladies and enjoy the sport and compete with the guys on every level. The competitive spirit never gets lost on the MX girls, races are just as sizzling, and are a joy to watch. There are many other girls at motocross events from all walks of life such as the 30 sec girls, models, fans, groupies and those just loving the sport & having a relaxing day out. Dirtbike babes make male riders sit up and take notice. They aren't just static trophy models anymore wearing their bikinis. Girls are often real strong riders, so when you view hot motocross babes, and bikini girls on dirtbikes you'll know they are not always just cool looking ladies posing for the camera. MX girls have been around almost since the history of the dirt bike. You can bet a manufacturer who places girls and motoX babes on their dirt bike stand, is sure to get attention! Lots of attention (& some sales) especially if those dirt bike girls are in swimsuits, or hot clothing. However between those extremes are plenty of cool ladies and female bikers strutting their stuff. MX gals make their mark. There are some highly skilled females riding competitively today, which has resulted in plenty of great gear being made JUST for girls when they are getting dirty on the track. Female riders are serious, busting their chops practicing every day just like the men and boys so they are able to handle the bike when the race gets on the ragged edge. You'll still get a babe in minimal apparel standing by a bike looking at it as if it is a bag of rotten garbage? 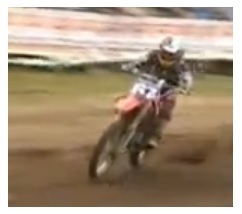 - some things never change......BUT Motocross is a serious sport. The first women duo to ride and finish the Baja 500 was Lynn Wilson and Mary McGee. Mary teamed up with Cherry Stockton shortly after that to ride in Las Vegas at the Mint 400, becoming the first women's team to cross the checkered flag. The Powder Puff National Championship in 1974 had a name change to the Women's Motocross Nationals in 1975 and in 1983 saw the first Women's Supercross Invitational held in San Diego. 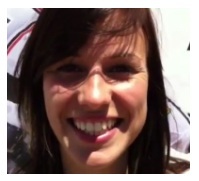 See this interview and practice run with WMX's Sarah Whitmore. WMX: Competitive and Real.